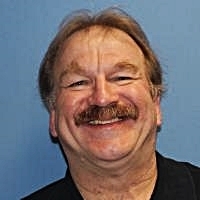 Since being paralyzed almost three decades ago, Dean Juntunen has competed in more than 90 wheelchair marathons, continued snowmobiling and four-wheeling, and taken up kayaking. Now, Juntunen is taking another significant step. And then another step. And then another. 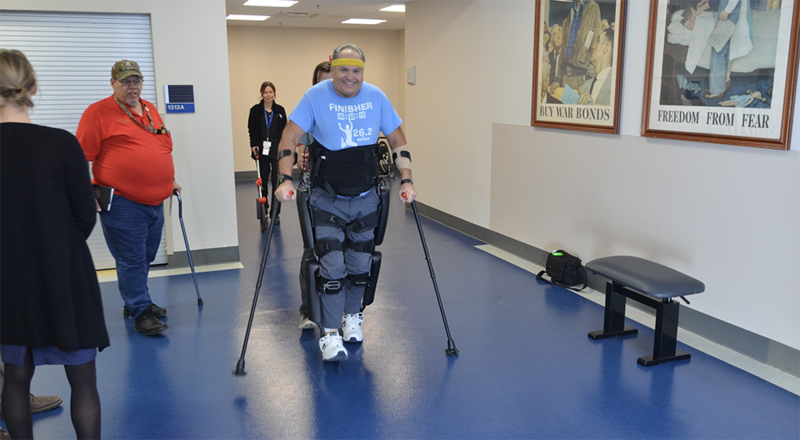 The medically retired Air Force captain is walking with the aid of a wearable exoskeleton robotic device as part of a study at the Spinal Cord Injury Center at the Milwaukee VA Medical Center. About 160 Veterans are participating in the program at 15 VA Centers across the country. 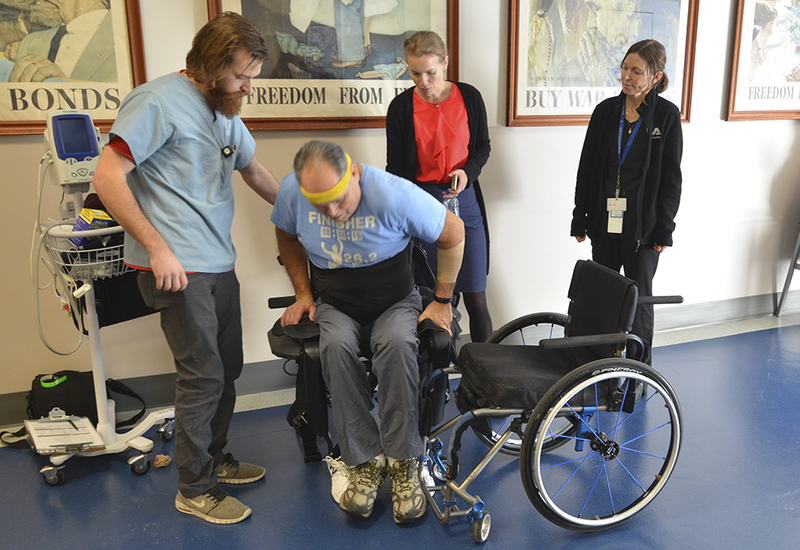 After completing a series of rigorous training sessions, Veterans in this study will take the exoskeleton home for use in everyday life. Participants must meet certain criteria, including bone density. Users should be between about 5-foot-3 and 6-foot-3 and cannot weigh more than 220 pounds. Juntunen was on active duty when he was injured in between assignments from Malmstrom AFB in Great Falls, Montana, to Wright-Patterson AFB in Dayton, Ohio, when his life changed. An avid hiker and outdoorsman, Juntunen’s life changed when a tree branch gave way and he fell 30 feet to the ground. Juntunen, who has an engineering degree, said the hardest part of mastering the robotic device was developing balance. Juntunen executes a challenging 180-pivot with the aid of VA trainers Cheryl Lasselle (left) and Zach Hodgson. Turns and pivots presented challenges, as did going up an incline, he said. Not all participants are able to sufficiently master the nuances of the 51-pound device to meet the requirements of the study. The training sessions at Milwaukee last about two to two-and-a-half hours, usually twice a day. 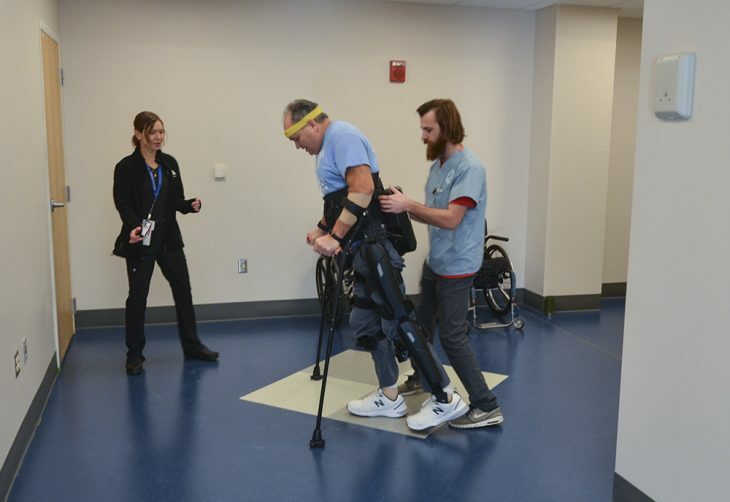 With the aid of certified trainers, Juntunen walked up to a quarter mile, starting with the lightly trafficked tunnel between the main hospital and the Spinal Cord Injury Center. He eventually progressed to one of the main public entries to the hospital, which had inclines, carpeted areas, and pedestrian traffic. Mastering use of the device in the public space was part of the requirement before Juntunen can take it home. When Juntunen takes the device home, companions trained to assist will replace the VA trainers. “He’s going to use this device in his home and community so we really get a good idea about how useful these devices are,” Hodgson said. At home, companions replace the VA trainers to help with the device. In Juntunen’s case, he’s getting help from his kayaking buddies. After completing training in Milwaukee, Juntunen is scheduled to have another session in mid-January at a shopping mall in Houghton, Michigan, tentatively followed by another session in the atrium of the Green Bay Packers Hall of Fame. Glad to see the biometric robotic equipement is being used to give our veterans the opportunity to walk , again hope to see more of these hurdles being crossed in the near future.